Energy storage system integrators play an increasingly important — and shifting — role as more renewable energy is added to the grid, according to a new Navigant Research report. Integrators design, build and operate large, grid-scale energy storage systems. Think Tesla and Fluence. In a recent interview with Microgrid Knowledge, Alex Eller, senior research analyst for Navigant Research, shed light on what integrators do and why their role is changing. 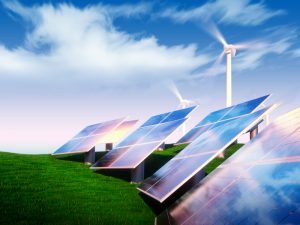 The utility-scale energy storage market has grown increasingly competitive since 2016. And as the market matures and expands, the integrators play a larger role in ensuring project success and profitability. Integrators are transitioning away from offering pure project development services and instead are providing integrated hardware and software systems for energy storage customers. 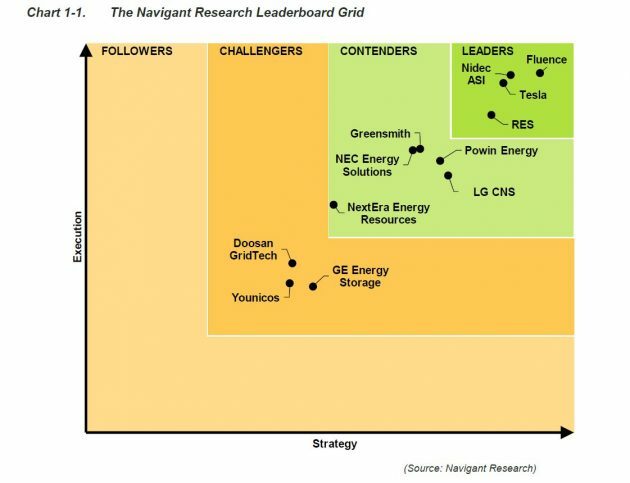 Often they leverage software and controls to maximize the value of a project, according to the report, Navigant Research Leaderboard: Utility-Scale Energy Storage Systems Integrators. The biggest energy storage market, long-term, is no longer frequency regulation because that market is becoming saturated. Instead, energy storage is increasingly used to help bolster renewable energy use on the grid. Generally, under this model, storage system integrators sign power purchase agreements (PPA) with utilities that include compensation for providing stored renewable energy released during on-peak hours, Eller says. Such projects are located all over the world, including Australia, the UK, and Japan. “Utilities will buy the solar and pay extra for the storage. They buy the energy delivered, under your standard PPA. The solar plant is owned by a developer or third party, and the utility buys all the energy generated but will say that the project has to provide some of the energy with storage, during times of peak demand,” he explains. In the report, Navigant evaluated energy storage system integrators based on analyses of the companies’ vision; go-to-market strategy; partners; production strategy; technology; geographic reach; sales, marketing, and distribution; product performance; product quality and reliability; product portfolio; pricing; and staying power. Projects may be built, for example, beside a solar farm and provide frequency regulation and grid service applications to a utility. An important factor in evaluating the integrators was whether the companies make an impact by educating regulators and other stakeholders in many different markets, says Eller. “A lot of companies are active working with regulators to establish new markets,” he says. For example, Fluence and Tesla have built pioneering projects. RES helped set up the market for a grid service program in the UK. These companies are helping overcome challenges from regulators and utilities. “The problem is that there are utilities and regulators that have been resistant to renewables on the grid in general. They’re new and different from any traditional grid system, so there’s a lot to get to speed up on,” Eller says. The leading energy storage system integrators have built microgrids, but they’re not generally grid-connected, Ellis says. That’s because microgrid developers face challenges connecting their projects to the grid. 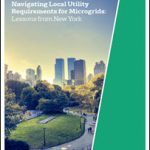 “With microgrids, one big issue is the existing rules that allow utilities to be the sole provider of electric service in an area. Customers are able to install microgrid/solar/storage systems ‘behind their meter’ that only serve themselves, but typically cannot connect to nearby buildings that want to share the power and the cost of the microgrid,” he says. However, some of the leading integrators have developed off-grid microgrids, on islands, for example. For the purpose of the report, those projects were integrated into Navigant’s analysis of the companies’ long-term strategy and expertise, he says. The report also looked at companies’ long-term strategies, including which companies they partner with, which products they offer and whether their systems are standardized, Eller says. The largest system built to date is Tesla’s 100-MW Hornsdale Power Reserve project in South Australia. After South Australia experienced blackouts due to storms, Tesla founder Elon Musk tweeted that his company could build a 100-MW storage plant in 100 days to help solve the problem, says Eller. Musk promised to build the project in 100 days — or Tesla would foot the bill for the project. Musk met his deadline, and the project, the largest lithium-ion battery in the world, owned by Neoen, now provides stability services for renewable energy and emergency backup power, according to material from Neoen Australia, a French renewable energy company. “That was a very clever tactic,” says Eller. The biggest system is in place and operating. From here, the market is expected to grow quickly, he says. And hopefully, the industry won’t need clever tactics like Musk’s to get projects on the ground. 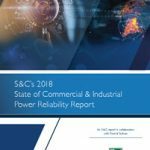 A summary of the report is available on Navigant Research’s site. Track news about energy storage. Subscribe to the free Microgrid Knowledge newsletter. You have left out Eguana Technologies, endorsed by Mercedes Benz. I am pretty sure one has to wait weeks to get Tesla’s crappy powerwall. …as usual.